Designing a kitchen entails a variety of details and decisions to turn your dream into a reality. Let’s admit, some are more exciting than others. One of the decisions to make while selecting cabinets is whether you prefer inset or overlay fronts. It’s an important detail that affects the bottom line, useful life and overall look of your final product. SO, WHAT IS THE DIFFERENCE OF EACH OPTION? Inset cabinets are simply stunning. 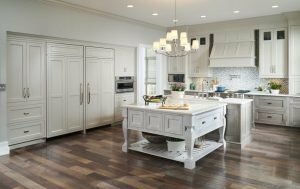 The sleek yet classic creative cabinetry design could be worth the investment for some but might be the deterring factor for others. A 15 to 20 percent cost increase from a similar style in full overlay should be expected. While inset cabinets are beautiful, temperature and humidity changes can cause the doors and drawers to expand and contract, which could result in them sticking. “Inset cabinets are one of the hottest styles but keep in mind they reduce the usable storage space of cabinetry,” says ACo owner, David Decker. One of ACo’s favorite creative cabinetry styles is a frameless cabinet construction. The thicker box construction gives the stability, storage and simple, sleek design many clients are longing for these days. Frameless cabinets, also known as full-access cabinets, do not have a face frame or a center stile between doors. The function and appearance are two major reasons to consider frameless cabinets. The next best option is called a full overlay. The full overlay cabinet gives the appearance of drawer and door fronts without frames, fillers or base cabinet showing. The fronts come in a grand variety of styles, the maintenance and expected life is longer and is the cost-effective choice for a luxury style. We understand, everyone has a budget. If that’s your case for a project, consider a standard overlay cabinet in the style and finish you like best. A perfectcompromise is combining kitchen amenities, such as full-height cabinets, unique hardware, two-tone perimeter and island as well as sleek appliances, with a standard overlay front. Do you feel well versed with the cabinet front options? Be sure to visit ACo and let one of their experienced designers help you through the choices. Visit them online at liveaco.com or give them a call at 317-5759540 to schedule your appointment. Finding your Palette: How to determine if color is the trend for you!